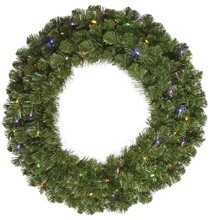 We are proud to carry a large selection of large oversized Christmas Wreaths perfect for most strip centers and malls. Our wreaths range from 48"-100" diameter making them a perfect accent for your commercial decorating needs. 60 inch Unlighted Princess Pine Big Christmas Wreaths. This unlite Princess pine big Christmas wreath has thick, poly vinyl, green branches. It can be used both indoors or outdoors. This stylish wreath has 520 artificial tips. Chose from five different sizes of our Camdon Fir. These large Christmas wreaths have no lights. 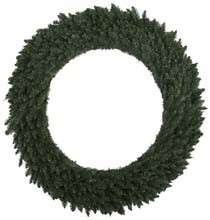 These are traditional commercial wreaths with lush, medium to dark green foliage. They can be used both outdoors and indoors. The large Grand Teton prelit wreaths come in nine sizes ranging from 48 to 300 inches. The commercial Christmas wreaths have warm white LED wide angle lights. There are two or more thick wire rings with cross members wirers connecting the rings. The commercial Douglas Fir Christmas wreaths come with no lights. This artificial Christmas wreath comes with medium green needles. They can be used both outdoors and indoors. Chose from five different sizes. 72 Inch Valley Commercial Wreath. This valley pine perfect Christmas wreaths have 1440 thick dark green branches. This needles are attached to a heavy duty 4 part wire metal frame.